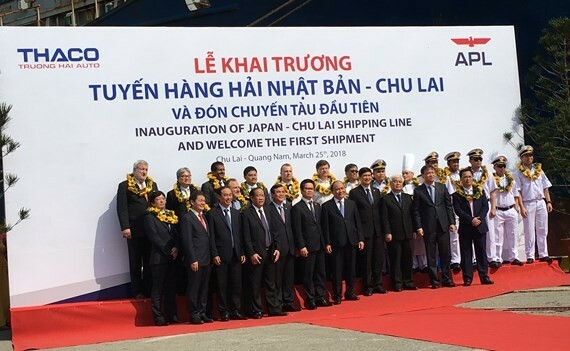 Inauguration of Japan- Chu Lai shipping line and the welcoming first shipment of the APL brand were opened at the Chu Lai Open Economic Zone in Quang Nam province this morning. 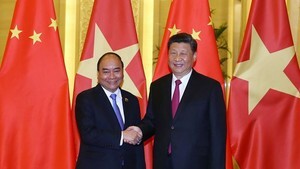 Vietnamese Prime Minister Nguyen Xuan Phuc and leaders of ministries, agencies and Quang Nam province attended in the ceremony. The APL brand is one of the world’s largest container shipping lines under the French group CMA with a global network. The first shipment imported consignment of car accessories from Hiroshima – Japan in order to meet the production progress of Thaco- Mazda Manufactory. The first container ship carrying car accessories of Mazda, equipment and machines is to serve car manufacture and assembly of Thaco- Mazda Factory and the Chu Lai-Truong Hai Auto Mechanical Industrial Park. Thaco also held an opening ceremony of Thaco-Mazda Manufactory this morning.